Issue #58 • March 14, 2019•Buy Now! The name you have entered is “Owen.” Is this correct? The loading image faded from the screen, leaving nothing but empty black around a lone figure sprawled across a bed that seemed much too big. Auburn hair flopped into view as the figure straightened, shifting to a sitting position. Long, pale fingers clenched the comforter as he sat on the edge. After a moment, he stood, pushing away from his perch and unfolding to stand on a creaking wooden floor. Then he took a shaky step, eyes scanning the room. They landed upon a dark window. He took another step. His eyes shifted from the window to a desk overflowing with papers. Another step. Finally, he found what he’d been searching for. A door. A looming gateway to perilous adventures. Once going through that door, there was no telling what would happen to him. He shifted his course towards it and took another step. Step after step after step. Hesitant footfalls causing the floor to shriek in protest. Interesting graphics, realistic sound effects. He reached the door and placed his hand on the doorknob. Hello, I’m Carlie Schwarm. After growing up mainly in Hawaii, my family moved to the south of France for two years before relocating back to the U.S. I’m currently a sophomore at Laguna Beach High School. I love rain and drink copious amounts of tea, preferably out of a much too large mug. Sleep doesn’t come easy on most nights, so I make up stories to while away the hours. I aspire to be a veterinarian, author, and artist one day, but for now I’m content with curling up with my dogs and a good book. The game is life. Life is the game. 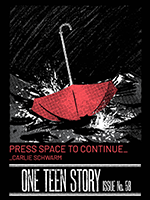 So it is for the main character in Carlie Schwarm’s “Press Space to Continue,” one of the winning stories in our Teen Writing Contest. The game, in this case, doesn’t involve chases through forests or mortal combat or even a group of obsessed athletes wanting their team to succeed. The game is on-screen (or is it?) and is being played alone (maybe) by a kid named Owen. Only, the boundaries have blurred. Where does the game stop and Owen’s life resume? And then there’s William, the young man who is suddenly there in the game with Owen, or is suddenly there in Owen’s life, or is—somehow—in both. When I asked Carlie Schwarm, in our Q&A, if she left some of these things deliberately vague, the answer was a confident yes—even while she told me the original draft of the story was nearly five times the length it is now. I love a story that has the guts to remain a little vague, and I love a story that raises questions and leaves some of those questions unanswered, allowing the reader to take part by speculating. “Press Space to Continue” does both of those things to great effect. We’re excited to introduce you to Owen and his game. CS: In the beginning, it was a writing challenge with one of my friends. Then it developed as I got to know Owen more and learned about this little-known mental illness called Depersonalization Derealization Disorder. From there, the narrative came to me on its own. The symptoms of that disorder and what’s happening with Owen are in no way similar, but I figured it could be an interesting allusion. Does he have DDD? Is this all a hallucination? Is any of this real? Or is it all just a game? PR: You employ a “question and answer” format throughout the story, where the game asks Owen a series of questions about how he wants to proceed. It’s a fun idea for a short story, and it makes for a fun reading experience. Were you tempted to have even more questions, or to use them in a different way? CS: I considered it, but I didn’t want to “overload” the reader or Owen. It’s still Owen’s life, he still makes his choices, he just has someone who tells him those choices. Also, there were meant to be fewer and fewer as the story went on and filling the beginning with them would have made that a lot more noticeable, which would have taken away from the feeling I was going for. I never really considered using them in a different way, but I don’t think it would have had the same effect. PR: Is the game taking over Owen’s life, or is Owen’s life taking over the game? CS: One could argue that the game is Owen’s life. I think, at the point where the story ends, Owen is slowly wrestling control from the game and taking his life back. PR: Were you going for a bit of mystery in this story? For example, is the reader meant to wonder if William is real? CS: When I was writing it, I purposefully left out a lot of qualifying details just for that effect. I want the reader to wonder about the reality of everything that is happening in the story, even if it is real. PR: How different is “Press Space to Continue” from the story you originally set out to write? CS: Originally, this story was upwards of 10,000 words and centered around a pair of drumsticks, so I’d say the current version differs quite a bit. Owen has stayed mostly the same through the transition, but his family, William, and the way I wrote the story all changed drastically. It used to be a story that lead up to a “boss fight” which consisted of him characterizing his feelings and mental afflictions as a hostile entity and confronting it. Unfortunately, that took a lot of buildup and, with this contest word limit, that wouldn’t have been possible, especially for achieving the same feeling. CS: I have a couple of novels in the works that I plan to finish during the summer. I also have a series of short stories I can’t wait to write but don’t have the time to right now. I’m working on the script for a comic book series called The Disease that I’m writing with my partner Bo. I’m actually really excited about the latter, it’s a great exercise for practicing dialogue and staging without having to worry about the conventions of writing. CS: It would have to be “let other people read your work,” which is less about the actual writing and more about what to do afterwards. I’m really self-conscious about my writing and have a hard time putting myself out there, so that was really helpful. I’ve finally started taking it to heart and am slowly showing more and more people my work.